First Appearance: Comedy Comics #10 (Timely, June 1942). 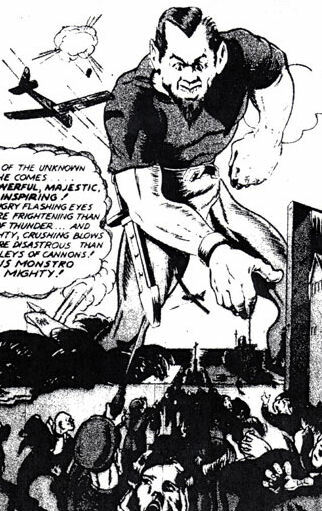 Powers/Abilities: A giant, standing over 50 foot tall - it may be he was able to shrink to the size of human, but I have no confirmation of this. Presumably he had superhuman strength. History: The son of Mars, god of war, Monstro fought in mortal wars for centuries. Eventually though, he grew tired of violence and death, but when he informed his father of this, Mars literally knocked him into the 1940s. Monstro appeared in the United States, manifesting as a 50' giant and causing a panic. After a little while, he was befriended by Major Crash of the Flying Intelligence Service, and by Crash's mechanic (and former boxer) Hook. He assisted them in capturing a female spy, Little Poison, then disappeared.